I did this for ages but nobody checked it and it was mostly forgotten and I gave up. Plus, new users who were only active for a week tended to add their birthday which was annoying when they were never seen again. But if you really want to, I'll try to find the time. Could birthday be a field in each member profile (optional of course) and then there would be a view of this available? Thing is, that would mean clicking on each person's profile, and then forgetting almost right away. I'll polish it up until Arry's birthday. Well, anyway, this thread is at least needed for the well wishes! I'm looking into a solution. Right now, I can get all the "upcoming" birthdays to show on the main screen at the bottom (while looking at it, I added upcoming Calendar events, so you can see where it would be). Problem is, we have so many old/inactive users, it's kind of a mess with the birthdays. It also shows age if people filled that out, and I dont know how users feel about that. But it is handy because it just pulls your birthday form the forum profile and no one has to maintain it. Yer a wizard birthday girl, Arry! Congratulations! I hope you can do your favorite pastime and paint some furniture today! If I missed some birthdays, please let me know. 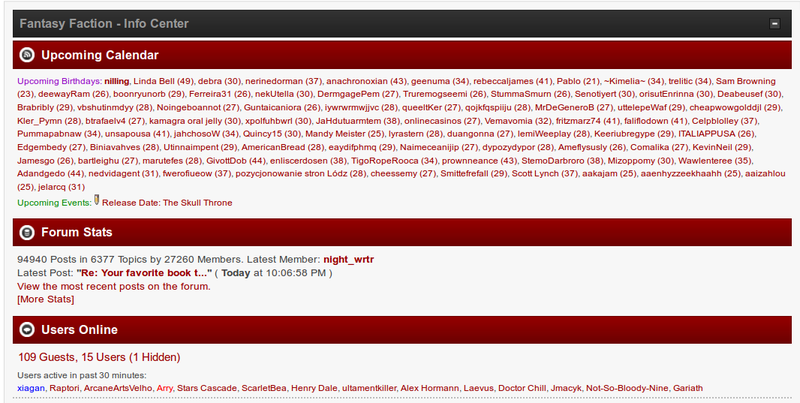 We decided against the forum feature because it would be a mess.